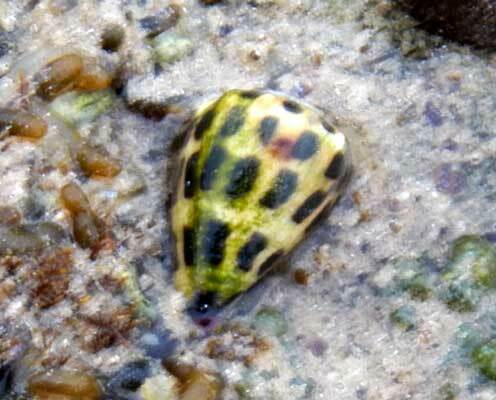 This cone snail was observed in a shallow tide pool north of Mombasa, Kenya, January 2012. Most Conus ebraeus are patterned with black and white. The yellow green color of this still live specimen might be due to excess algae growth which in turn could be due to sewage discharge into the sea at Mombasa. The sharply contrasting markings are aposomatic, i.e. a warning to would be predators or curious beach combers, that this mollusk is capable of delivering a poisonous bite. These predatory snails also use the venom to subdue their prey; this species apparently preys on annelid marine worms.